Of course, you don't want your house feeling too cold which is what all white can bring, so a great way to warm it up is with textures, other neutrals, layers, and pops of color. 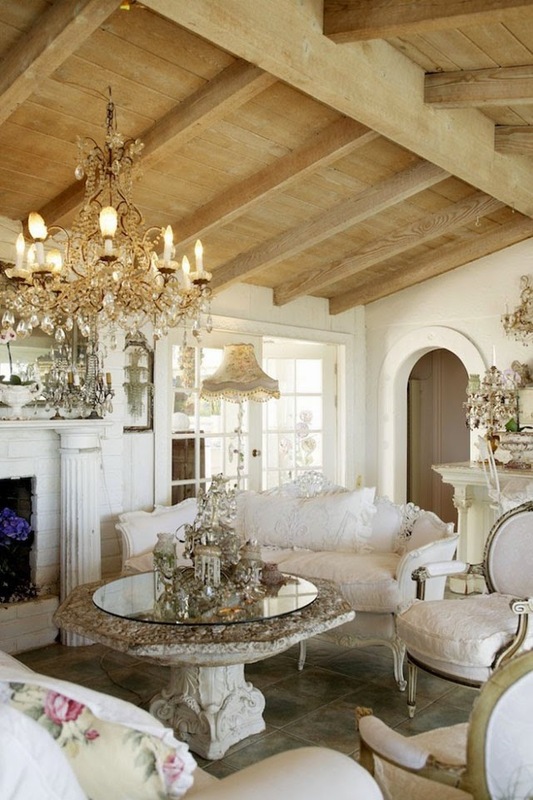 I love this room because of all the white with the wood accents. This of course can be done a much smaller scale with wood and white accessories. The textures of the rug and the wood bring in much needed warmth to this living room. Even the texture in the wreath warms up the painted brick fireplace. 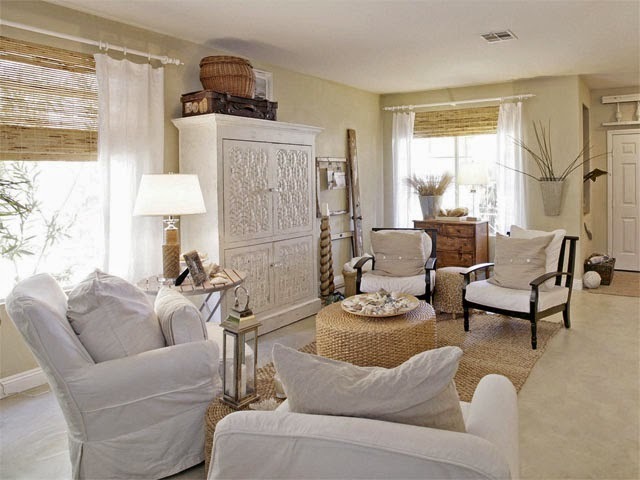 Here's a great way to keep mostly everything white but bringing in other neutrals such as greys and creams. I would die for that ceiling! Here's a beautiful neutral bedroom with pops of gold, wood and browns. This bedroom offers some easy decorating ideas to bring white into your room without changing your furniture. 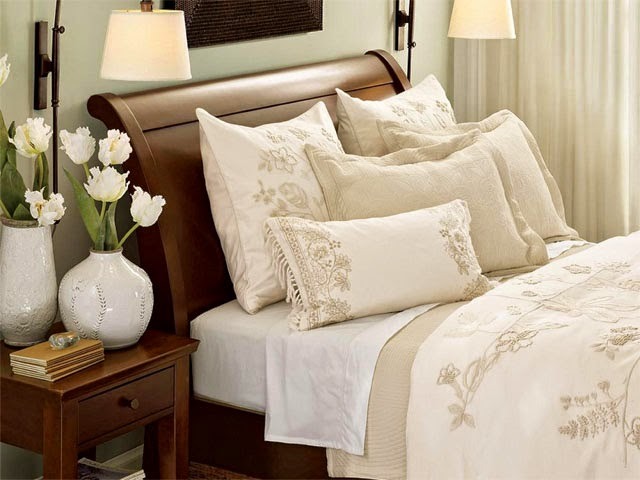 Just change out your bedding from some white linen and swap out your accessories with some white ones like the white flowers in the white vases shown here. Here's a great way of layering. Not just adding pillows and blankets, but also by layering the windows with curtains and bamboo shades. Even adding all the piles of books works as layering also. This living room offers so many ways to decorate with white while still keep it cozy. There's tons of textures and layering going on. To me this bedroom just screams comfort and style. Not only is the texture in here amazing, brought in by the rug and bench, but the pop of color from the flowers is perfect. 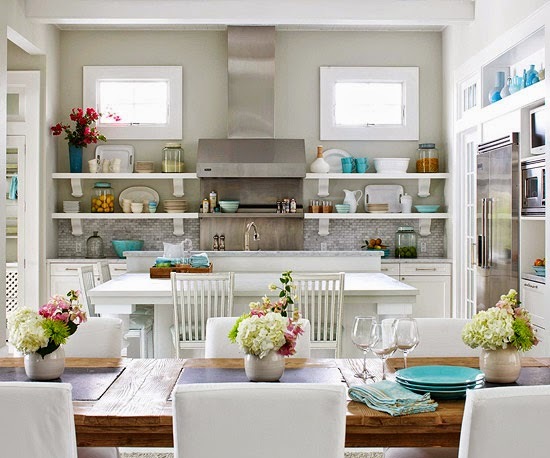 This kitchen offers a great example of adding pops of color into an all white color scheme. The turquoise in the dishes and the pinks and greens in the flowers keeps it from looking too sterile. Now I'm all for keeping everything white and neutral, but of course that's not practical for most people. So, a great way to play up this Winter White in your home is to bring it in through accessories. Change out your curtains; add a nice plush white throw to the couch; make some new shams for your accent pillows; switch out accessories on bookshelves. I'm excited to show you what I've done around my house in the upcoming weeks to bring Winter White in :) Let's just see if this baby get's here before then or not. Wonderful interior design and decorations. I like this. Thanks for your post. Pleasant home. Like to live in this place. Pleasant home. Likes to live like this place. I Like very much nice place home this very beautiful home thanks to sharing this article nebosh course in chennai | iosh course in chennai| safety training in chennai | Industrial safety training in chennai | Fire and safety courses in chennai its really very nice. Wow! Amazing decorations, its very impressive and attractive, thanks for sharing this post.